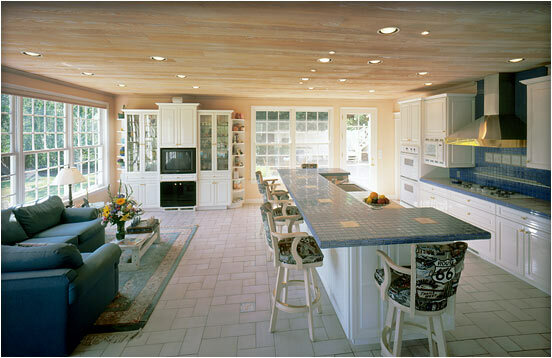 Larger Project 3-4, Kitchen Remodel » Roger Perron Inc. This photo shows a family room addition with kitchen remodel. Beyond is the entertainment center we built. The island has a second sink and custom designed tile, which correlates to the tile floor design. The ceiling was sand-blasted fir wood stained with whitewash, which gives it a pink and white natural look.